MailBar 1.2.7 – Manage your Inbox from the menu bar. MailBar enables you to check your inbox and manage your emails directly from your Mac’s status bar. The light and discreet application is designed to run in the background and display the number of new emails next to its menu bar icon. Thanks to MailBar, you can monitor and manage up to four different mailboxes. From MailBar’s status bar menu you can easily view all existing emails or filter the list by showing only the unread messages. On top of that, MailBar comes with a powerful built-in search form that enables you to narrow down the list of displayed emails. What is more, MailBar offers you the option to mark a message as read, reload it and even open it and read it directly from within the app. MailBar also offers you the option to pin its status bar menu to your desktop as you read and go through your emails. By accessing the Preferences window, you can easily assign different colors to you mailboxes, enable or disable an inbox and select a different sound notification for each inbox. In addition, MailBar can be configured to automatically check for updates and launch at startup. Added support for "smart mailbox folders". Added ability to control point size in the dock icon. Added ability to show unread count separately in the menu bar. Next story TechTool Pro 8.0.2 – Hard drive and system repair-and-maintenance tool. Previous story aText 2.18 – Automatically replaces abbreviations with frequently used phrases. 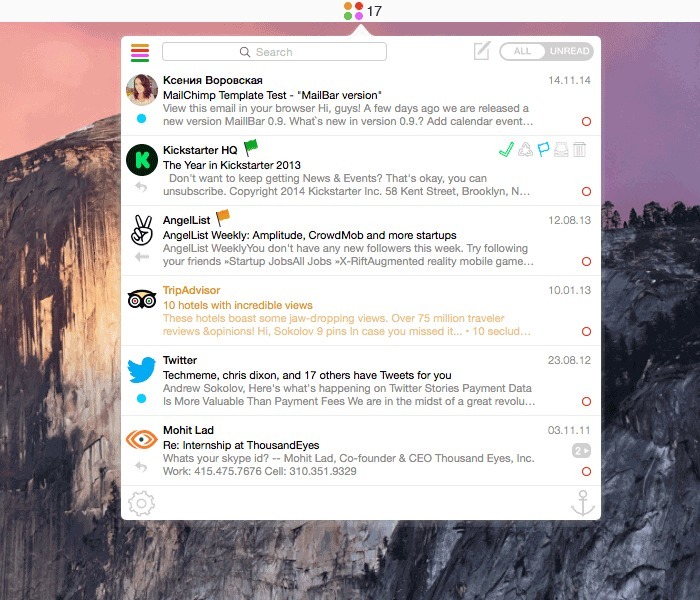 MailBar 1.1.9 – Manage your Mail.app inbox from the menu bar. MailBar 1.1.8 – Manage your Mail.app inbox from the menu bar. MailBar 1.1.5 – Manage your Mail.app inbox from the menu bar.